Jian Man-Shu is the Sheep and Ko Chen-Tung is the Wolf in When a Wolf Falls in Love with a Sheep. 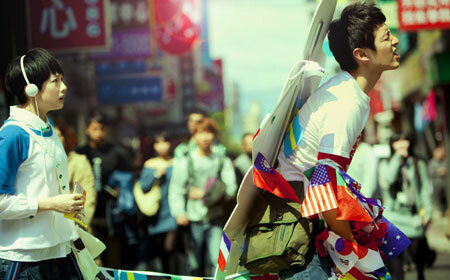 The Skinny: Cute Taiwan romcom that flails enjoyably until its inconsequential end. An abundance of voiceover and conflicting messages muddles matters, but the in-your-face quirkiness will charm if it doesn't annoy first. A solid entry in an ever-popular genre. by Kozo: Well-made though questionably substantial, When a Wolf Falls in Love with a Sheep still has enough in its youth romance tank to charm and entertain. You Are the Apple of My Eye up-and-comer Ko Chen-Tung stars as Tung, who gets served with a passive-aggressive break-up Post-It from Ying (Nikki Hsieh). She says she’s off to cram school but what she really means is “Hasta la vista,” and the heartbroken Tung initially does nothing about it. After spending days in a stupor, he’s evicted from his apartment, so he gathers his belongings and heads to Nanyang Street, where all the cram schools in Taipei are located. His goal is to find Ying because she isn’t answering her phone and seems to not have friends, family or a Facebook account. Ying is obviously a rare bird (She doesn’t have Facebook? Amazing! ), so no wonder Tung is hot to get her back. While looking for Ying, Tung bides his time at a printing shop, where he earns meager bucks photocopying test papers for the cram schools. On the job, Tung meets Yang (Jian Man-Shu), an employee at “Sure Win” cram school who draws little cartoons featuring sheep on the school’s test papers. Yang (which translates to English as “sheep”) is quirky and cute, and Tung regards Yang and her cram school colleagues with a bemused distance. Tung and Yang begin a friendly affinity when he spies her sleepwalking at night, but the big event is when Tung becomes “the Wolf.” Tung draws a cartoon wolf on a test paper next to Yang’s cartoon sheep, and after the drawing gets mistakenly distributed to her entire cram school, a local meme is born. The Wolf meets the Sheep, but will Ying turn up before love can blossom between Tung and Yang — where it obviously really should? The outcome is a foregone conclusion, but writer/director Hou Chi-Jan (One Day) creates some suspense along the way. When a Wolf Falls in Love with a Sheep is one of those elliptical takes on love, where beginnings and endings matter more than grind-it-out relationships. Whimsical, quirky, magical, beguiling — these are adjectives that easily describe Hou’s characters and world, with fun characters and details popping up regularly. Love and heartbreak are portrayed here with a safe and colorful charm made-to-order for fans of postmodern youth romance. Hou does go overboard with his objects-as-metaphor trope; one of Tung’s jobs is looking for lost things (a lost dog figures in heavily), and he also attempts to reunite people with their neglected, left behind possessions. These are easy-to-please and familiar concepts — after all, who hasn’t discarded a bitter reminder of lost love, only to regret losing that once-cherished possession later? At the same time, Hou goes out of his way to imply that perhaps a person should leave things in the past, a contradictory but sensible idea since Tung getting over Ying is necessary if he’s to hook up with Yang. When a Wolf features an abundance of voiceover from Tung, giving us a view into his heart but also jumping often from subject-to-subject. There are lessons and observations here, there, everywhere — and the abundance of info can overwhelm, with new stories and routine wisdom cropping up every few minutes to amuse or potentially annoy. Some minutiae are explored while others are not, e.g., why is Tung’s boss (a funny Tsai Chen-Nan) such a childish busybody, and why does a street hawker (Seediq Bale’s Lin Ching-Tai) appear mysteriously to dispense wisdom and noodles whenever needed? At some point, everything becomes a bit too coyly whimsical and precious.